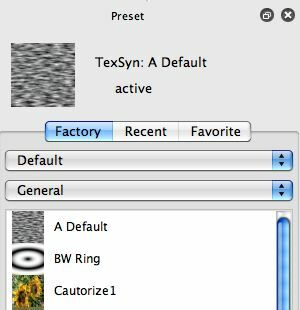 The Texture Synthesizer provides a way to create resolution independent texture field based effects. 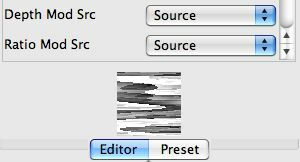 It can also be used as a modulator in many Image Operations, or as a background texture module in the paint synthesizer. 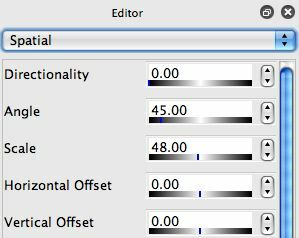 or work directly in the Editor palette to modify existing presets or build you own custom texture based effects. There are 5 different editable control panels associated with the texture synthesizer. You can access the different individual control panels via the popup at the top of the Editor palette when in texture synthesizer operation mode. They are named Spatial, Generator, Mapping, Effect, and Output. The Spatial controls adjust the spatial characteristics of the texture field. The Generator controls determine the type of texture or turbulence field generated. The Mapping controls adjust how the texture field values are mapped into the luminance range of the canvas. The Effect controls specify the specific texture based effect derived off of the generated texture field. The Output controls specify the mix and compositing of the texture effect with the existing canvas layer. A small texture preview image is displayed at the bottom of the Editor. This texture field preview updates in real time as you adjust various spatial, generator, and mapping parameters. 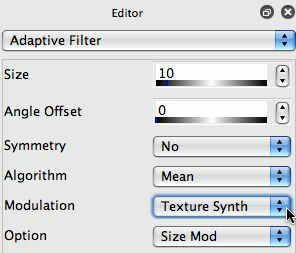 A complete description of all the texture synthesizer editable parameters is provided in the Studio Artist User Guide pdf. Texture Synthesizer effects are derived off of a resolution independent texture field. 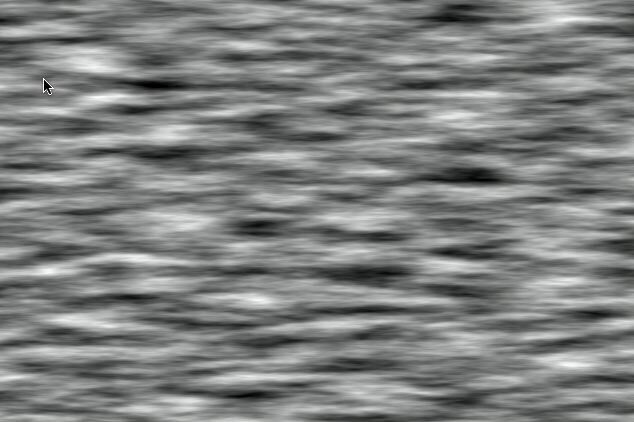 An example of a texture field is shown below. An example of a textue based effect derived off of the texture field displayed above is shown below. A wide range of different effects can be derived off of a given texture field. 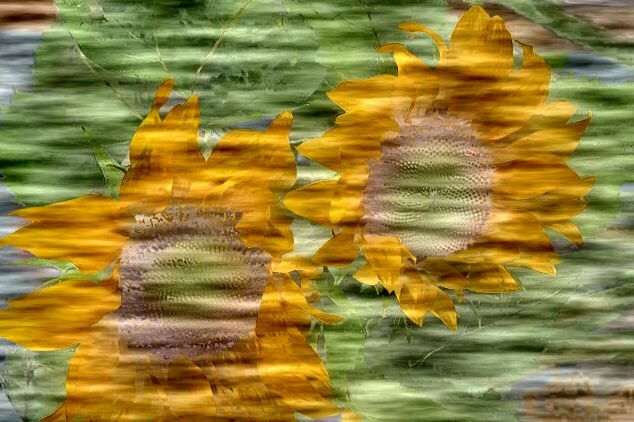 The texture synthesizer has extensive internal modulation capabilities, so components of the current canvas or source image like the luminance or orientation can be used modulate characteristics of the generated texture field. Many Image Operations include modulation parameters that offer a Texture Synth modulator option. For example, the screen snap below shows the Adaptive Filter Ip Op configured to use Texture Synthesizer modulation. What this means is that the texture field specified by the spatial, generator, and mapping parameters is used as the Adaptive Filter modulator. 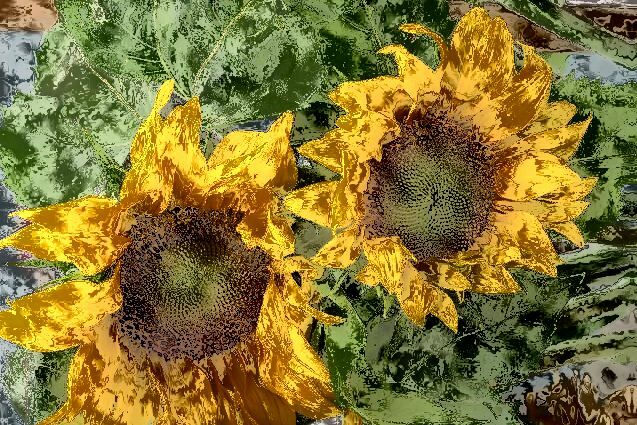 The texture synthesizer and it’s associate texture field controls become an integral part of an image operations effect when this modulator option is specified.